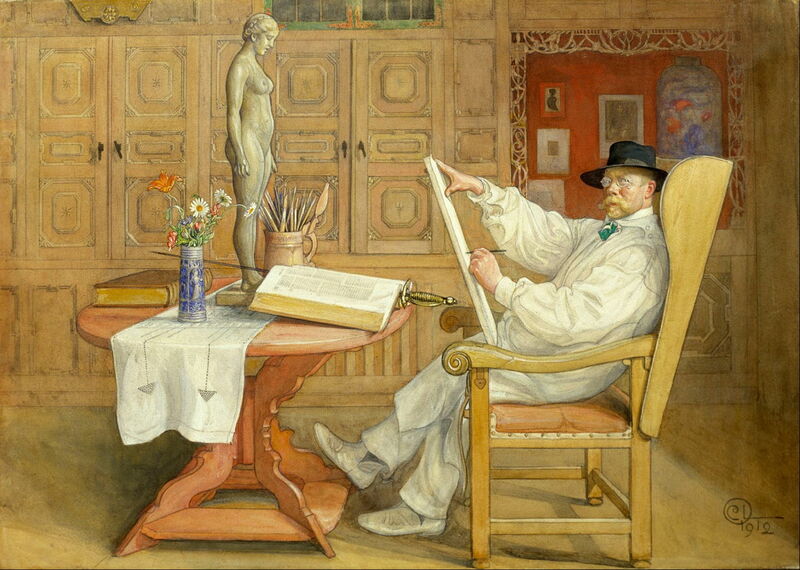 Carl Larsson (1853–1919), Self-Portrait (In the new studio) (1912), watercolour on paper, 54.3 x 75 cm, Malmö konstmuseum, Malmö, Sweden. Wikimedia Commons. 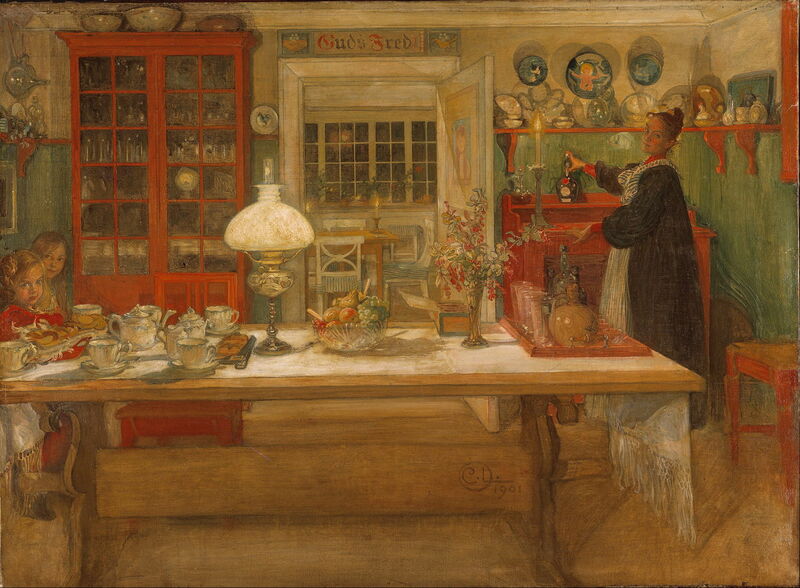 By the closing years of the nineteenth century, Carl Larsson (1853–1919) had established his reputation as one of the major artists active in Sweden. He had painted a series of frescos in the Swedish National Museum in Stockholm, and his watercolours showing idyllic family life were catching on too. 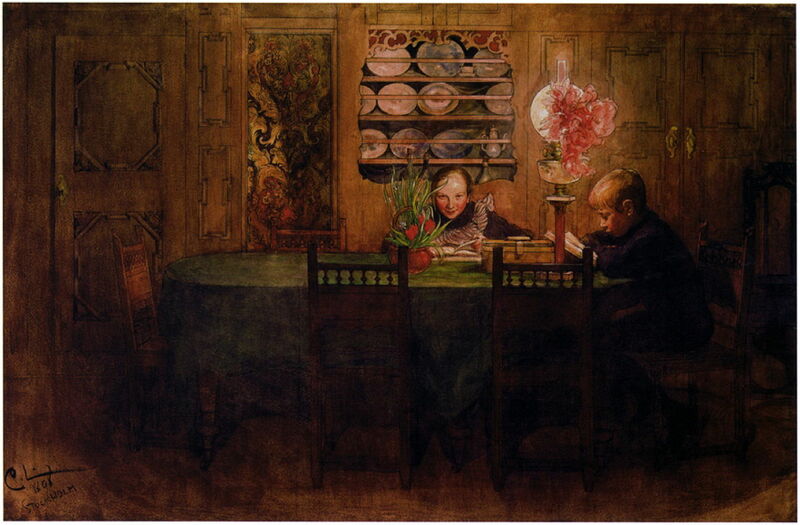 Carl Larsson (1853–1919), Homework (1898), media and dimensions not known, Göteborgs konstmuseum, Göteborg, Sweden. Wikimedia Commons. Among Larsson’s more personal views of family life is Homework from 1898, which shows two of the Larsson children working in the evening by the light of a kerosene lamp. His first book, A Home, was published in 1899, and proved popular in the Nordic countries given its relatively expensive production. 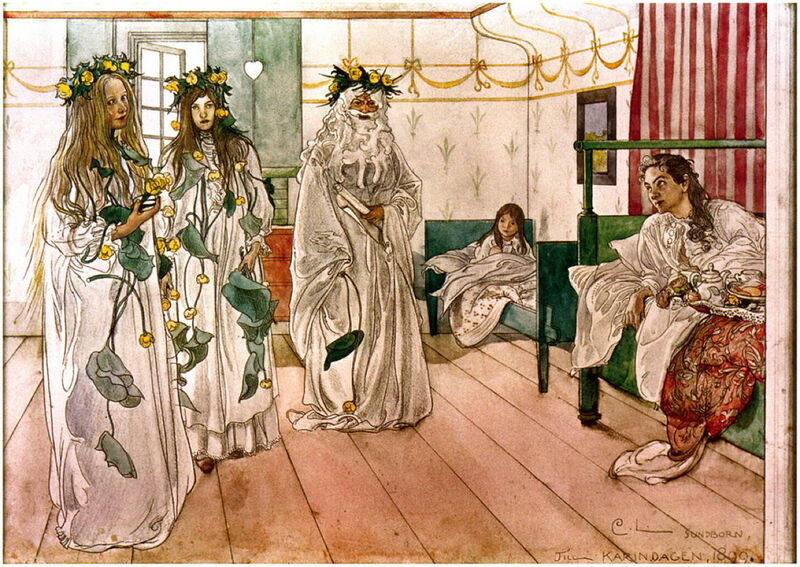 However, all was not well within the Larsson home, as Carl’s wife Karin became gravely ill.
Carl Larsson (1853–1919), Greetings (for Karin’s Day) (1899), further details not known. In Greetings (for Karin’s Day) (1899), Larsson not only celebrates his wife’s name day, but also her recovery from that illness. The family are here surrounded by the fruits of Karin Larsson’s interior design. Carl Larsson (1853–1919), A Fairy (1899), further details not known. Wikimedia Commons. 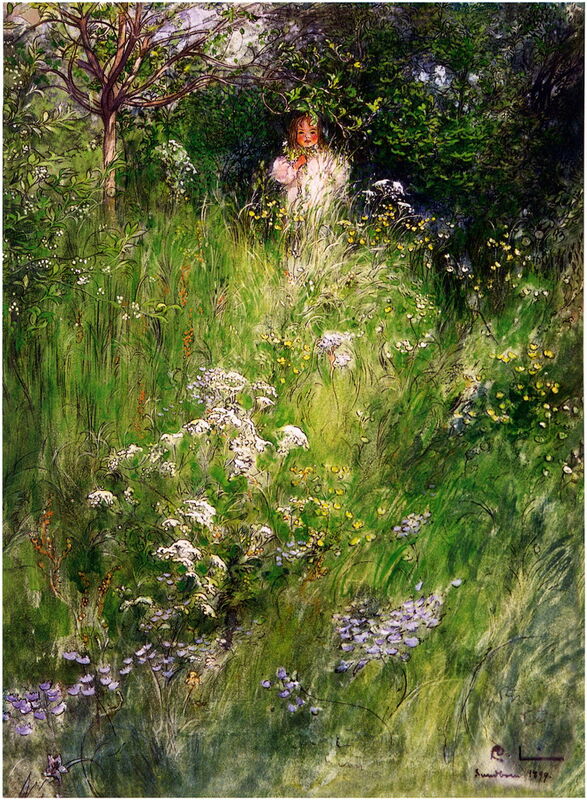 Larsson continued to paint more personal works which were not intended for reproduction in his books, including A Fairy (1899). This follows on from his earlier more Impressionist paintings, and again uses his favourite colour contrast of red against green. In 1900, Larsson was awarded a First Class medal at the Exposition Universelle in Paris. Carl Larsson (1853–1919), Getting Ready for a Game (1901), oil on canvas, 68 x 92 cm, Nationalmuseum, Stockholm, Sweden. Courtesy of Nationalmuseum, via Wikimedia Commons. Getting Ready for a Game (1901) shows Karin Larsson preparing a tray of decidedly adult refreshments, while two of their young daughters watch from behind the more appropriate teaset. From the layout of the room seen through the open door, the grown-ups are about to enjoy an evening of cards together with friends. In 1902, Larsson’s second collection of watercolours was published under the title Larssons (The Larssons), which sold well and has even been reproduced in a modern facsimile edition. This was followed in 1906 by a third book, Spadarfvet, Our Place in the Country, which proved as popular as the first. Carl Larsson (1853–1919), Gustav Vasa’s procession into Stockholm, 1523 (1907), oil on canvas, 700 x 1400 cm, Nationalmuseum Stockholm. Wikimedia Commons. Larsson also pressed on with monumental murals for the National Museum in Stockholm, which he had been working on for over a decade. In 1907, he completed that of Gustav Vasa’s procession into Stockholm, 1523 which celebrated the accession to the throne of King Gustav I, who reigned until 1560. Gustav had led a rebel movement against King Christian II of Denmark, who had ruled Sweden as part of the Kalmar Union. Eleven days after being elected to lead the independent Sweden, Gustav’s entry into Stockholm marked the birth of the nation. Carl Larsson (1853–1919), After the Prom (1908), watercolor on paper, 52.6 x 74.5 cm, Malmö konstmuseum, Malmö, Sweden. Wikimedia Commons. After the Prom (1908) shows one of Larsson’s older daughters, probably Suzanne (then 24), at the end of a Prom in the University of Stockholm. Behind her is an inscription explaining the two large murals on each side, which had probably been painted by her father. His easel and some paintings at the right suggest that he may have been painting other portraits that night. In 1909, a selection of Larsson’s watercolours was published in Germany under the title Das Haus in der Sonne (The House in the Sun); this was an instant success, selling forty thousand copies in the first three months, and was frequently reprinted thereafter. When Larsson painted his Self-Portrait in his new studio in 1912, he sits back with the ease of a successful artist in his late fities. Around him are the creature comforts furnished by that success, and designed by his wife. There are some gentle touches of eccentricity, like the sword passing through the huge book open in front of him, and the statue whose feet are propping the book up. 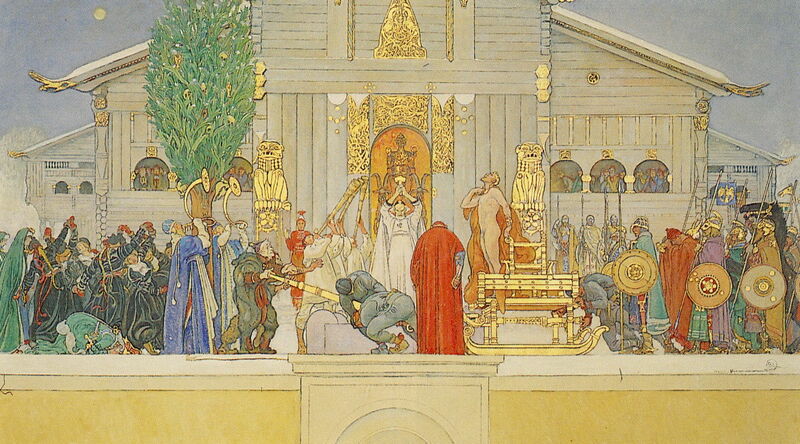 Larsson’s last, and what he intended to be his greatest, mural for the National Museum was drawn from the mythical sagas of the Icelandic writer Snorri Sturluson, with additional material from Adam of Bremen. Larsson wanted it to form a contrast with the other murals which he had already painted. It shows a dramatic scene which does not have any parallel in official Swedish history, of the sacrifice of the mythical King Domalde. According to Snorri Sturluson, there had been many years of crop failures, and the gods had demanded pagan sacrifice to appease them and ease the suffering of the people. 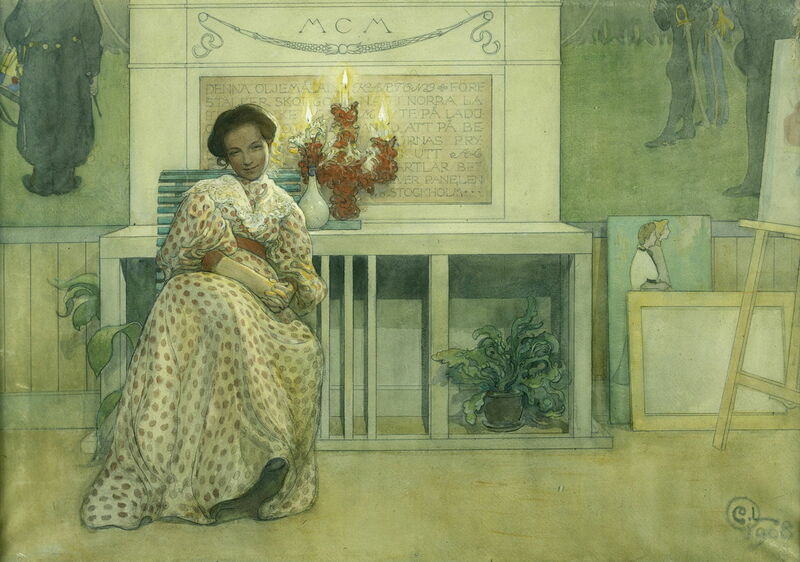 Carl Larsson (1853–1919), Preparatory study 3 for Midvinterblot (Midwinter’s Sacrifice) (1915), oil on canvas, 123 x 199 cm, Nationalmuseum Stockholm. Wikimedia Commons. For this, Midvinterblot (Midwinter’s Sacrifice), he had painted a series of studies which had proved controversial, and were successively rejected, requiring many changes. This is his third and final study, to which he had returned after resigning from the task in acrimony in 1914. However, the controversy which his earlier studies had generated had not settled. Debate continued in the newspapers, even involving government ministers. More recently it has been proposed that the underlying problem with Larsson’s painting was that it failed to meet the modernist ideals of Sweden in the early twentieth century. 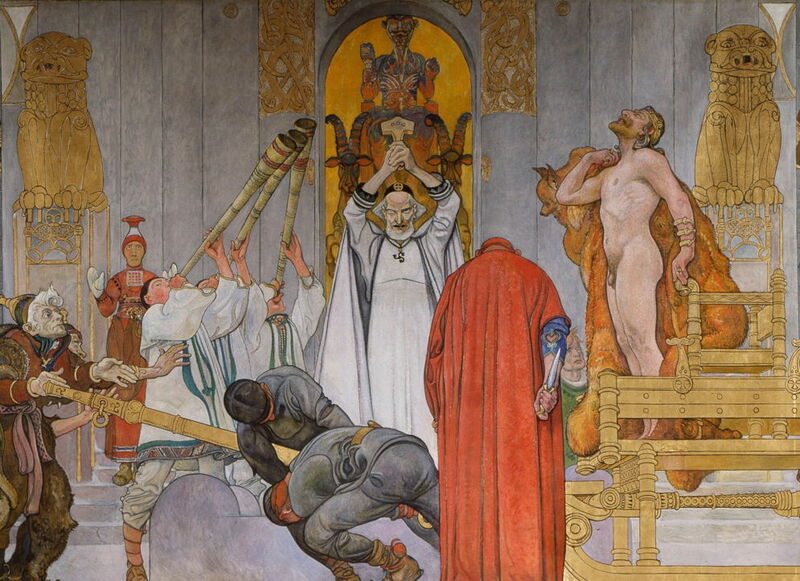 Carl Larsson (1853–1919), Midvinterblot (Midwinter’s Sacrifice) (1914-15), oil on canvas, 640 x 1360 cm, Nationalmuseum Stockholm. Wikimedia Commons. 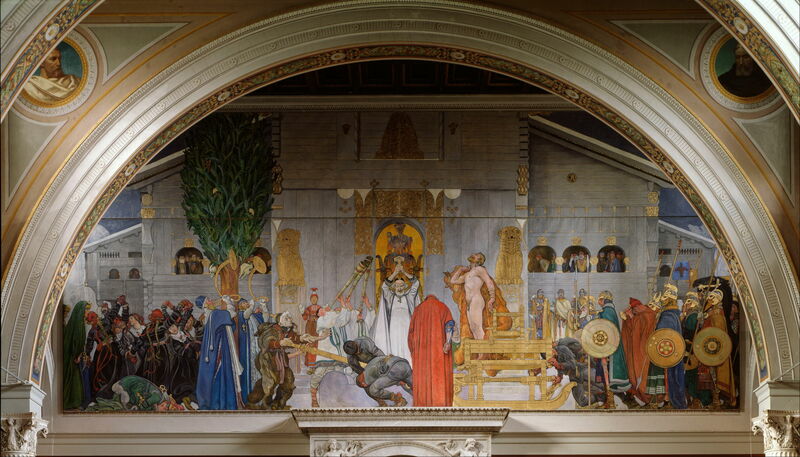 Larsson completed the massive painting (above), and it was exhibited where it was intended to go in June 1915, before being finally rejected and removed. Carl Larsson (1853–1919), Midvinterblot (Midwinter’s Sacrifice) (detail) (1914-15), oil on canvas, 640 x 1360 cm, Nationalmuseum Stockholm. Wikimedia Commons. Here, in the midwinter, the king has been dragged on a gilded sled in front of a temple in ancient Uppsala. The high priest who is to perform the sacrifice conceals the knife behind his back, as the king is about to step off the sled onto the altar. At the far left, women are in religious ecstasy, behind priests who blow ritual horns. Beside them is a miniature earthly Yggdrasil, which Adam of Bremen reported was evergreen. At the far right are the king’s warrior chiefs, following the sled. Larsson retreated into writing his autobiography, which he completed shortly before his death exactly a century ago today, on 22 January 1919. His final masterpiece had still not been accepted, and he was bitter to the end. His painting was shown again at the National Museum between 1925-1933, then removed. In 1983-4, the painting was exhibited in the Museum of National Antiquities. It was first offered to the National Museum, which again declined, and the Museum of National Antiquities was unable to pay the asking price for it. It was sold to a private collector in Japan in 1987, from auction at Sotheby’s, only to be loaned back for the National Museum’s bicentennial celebrations in 1992. Since then it has remained there, at first on loan, but in 1997 it was finally purchased by the museum and installed where it had originally been intended. It is easy to think that the only art of that period worth taking notice of was Cubist, or at least strongly Post-Impressionist. Throughout the twentieth century, and today, there are many great and wonderful paintings which have remained realist. One big difference, though, is that rather than being controversial by virtue of the way in which it expressed the artist’s intentions, Larsson’s was controversial by virtue of its content. At least in using conventional means of expression, there was little doubt over Larsson’s meaning. Perhaps the image of a king giving his life to save his people was a little close for comfort. Puvogel, Renate (1994, 2003) Carl Larsson, Watercolours and Drawings, Taschen. ISBN 978 3 822 88572 7. Posted in General, Life, Painting and tagged Larsson, painting, Sweden. Bookmark the permalink.